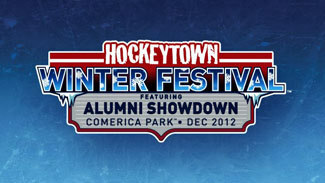 The Detroit Red Wings and Toronto Maple Leafs announced Thursday the addition of seven players who will participate in the festivities surrounding the 2012 Maple Leafs vs. Red Wings Alumni Showdown on Dec. 31 at Comerica Park as part of the 2012 SiriusXM Hockeytown Winter Festival. Detroit has added defenseman Aaron Ward as well as forwards Red Berenson, Jimmy Carson and Dennis Polonich. In addition to having suited up for the Red Wings, all four of these players were members of either minor league or collegiate teams in Michigan during their respective careers; Berenson and Ward both attended the University of Michigan prior to turning pro while Carson – a metropolitan Detroit minor-hockey product – and Polonich each competed in the International Hockey League for various Michigan-based clubs. Toronto, meanwhile, has added former enforcers Tie Domi, Brad May and Dave 'Tiger' Williams -- the NHL's all-time leader in penalty minutes (3,966) -- to their alumni roster. Between the three of them, Domi, May and Williams spent nearly 10,000 minutes in the penalty box over the course of their 3,023 combined regular-season games. Acquired in a trade with the St. Louis Blues on Feb. 6, 1971, Gordon Arthur 'Red' Berenson had 73 goals and 128 assists in 283 games with the Red Wings. The Regina, Sask. native skated in 987 career NHL games, totaling 261 goals and 397 assists for the Red Wings, Blues, Rangers and Canadiens. Upon retiring as a player, Berenson moved behind the bench – first in the NHL with St. Louis and Buffalo and later at his alma mater, the University of Michigan. Now the fifth-winningest coach in collegiate hockey history, the 72-year-old bench boss has amassed a career record of 752-352-77 in 28 seasons with the Wolverines, capturing a pair of NCAA titles (1996, 1998) as well as a National Coach of the Year award (2008). Originally selected by Los Angeles with the second pick of the 1986 Entry Draft, Carson played 626 games for Los Angeles, Edmonton, Hartford, Vancouver and Detroit. Born in Southfield, Mich., Carson scored 275 goals during his tenure in the NHL, still the 19th-highest total in League history amongst U.S.-born players. Carson also had 286 assists during his 12 NHL seasons to finish with 561 points. In his 240 games with Detroit, Carson had 100 goals and 102 assists, ranking him fourth in franchise history in scoring by a U.S.-born player. A native of Foam Lake, Sask., Polonich broke into the NHL with the Red Wings during the 1974-75 season and went on to appear in 390 games for Detroit and 360 games for Adirondack/Virginia (AHL) over 11 seasons with the franchise. The 5-foot-6, 165-pound agitator finished in the top 10 in the NHL in penalty minutes for four straight seasons between 1975 and 1979. Polonich finished his playing career with the Muskegon Lumberjacks, helping the western Michigan-based club win the Turner Cup as IHL champions in 1985-86. He retired the following season. Selected by Winnipeg with the fifth pick of the 1991 draft, the Red Wings acquired Ward in a trade with the Jets on June 11, 1993. The Windsor, Ont. native skated in 276 regular-season games for Detroit, as well as 30 playoff games. Ward was a part of the Red Wings' Stanley Cup championship teams in 1997 and 1998. Traded to Carolina on July 9, 2001, Ward won another championship with the Hurricanes in 2006. The 6-foot-2, 209-pound blueliner had 44 goals and 107 assists over 16 seasons in the League. Williams played 15 seasons in the NHL, the first six with the Maple Leafs, who selected him in the second round (No. 34) of the 1974 draft. In addition to his League-record penalty-minute total, Williams also had four 20-goal seasons, and finished his career with 241 goals and 272 assists in 962 games -- including 55 with the Red Wings in 1984-85. Domi, third all-time with 3,515 penalty minutes, spent 12 of his 16 NHL seasons with the Leafs. A 1988 second-round pick (No. 27) of Toronto played two games with the Leafs in 1989-90, then after playing with the Rangers and Jets, returned to the Leafs in 1994-95 for the final 11 seasons of his career. Domi is 11th on the Leafs' all-time list with 777 games played, and first with 2,265 penalty minutes. May played 38 games for the Leafs in the 2008-09 season, totaling two points and 61 penalty minutes. The Toronto native then spent the following season, his 18th and last in the NHL, with the Red Wings. He had one assist and 66 penalty minutes in 40 games for the Wings, bringing his final career totals to 288 points and 2,248 penalty minutes in 1,041 games. Updated alumni rosters for Toronto and Detroit can be found below. Further roster additions for both teams will be announced in the coming weeks.